LE JAS DU BOEUF – MAISON D’HÔTES DESIGN EN PROVENCE from Mille Sabords on Vimeo. 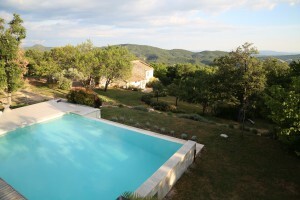 Nestled on the southern slopes of the Montagne du Lure under the clear blue skies of Provence near Forcalquier, Le Jas du Boeuf offers a little luxury in a magical location with great views. Calm is guaranteed by hundreds of acres of forests and fields scented with wild herbs and lavender, yet great little restaurants are just down the road. There are no neighbours within view or hearing distance and all four rooms have their own private entrances directly from the gardens. You can choose between old stone walls in the beautifully restored sheep barn dating from 1718 or modern poolside bungalows that pull the outside in. Borrow a book from the library and read in one of the many shady corners of the grounds, hike up the mountain or just stroll along a path and enjoy the views and fresh air before taking a dip in the heated infinity pool, which is salt and chemical free thanks to the latest UV cleaning technology. Thick stone walls, poured cement floors, good insulation, and cool evening breezes keep all of our rooms cool in the summer. Our Wifi system works in both of the rooms in the Jas and in various hot spots outside. Most guests connect over breakfast and our guest laptop is usually available. You can also prepare light meals and keep a few beverages cool in the summer kitchen overlooking the pool. We hope to have the pleasure of welcoming you back to the Jas or showing you its magnificent setting for the first time. “A haunting perfume lingers over the countryside of Provence. It is indefinable, but it seems to contain a dash of lavender, the odor of ripe melons and drying figs, the aroma of pure olive oil blended with a suspicion of fennel, thyme, and saffron, and, of course, a gentle breeze of garlic.” – Samuel Chamberlain, 1952. 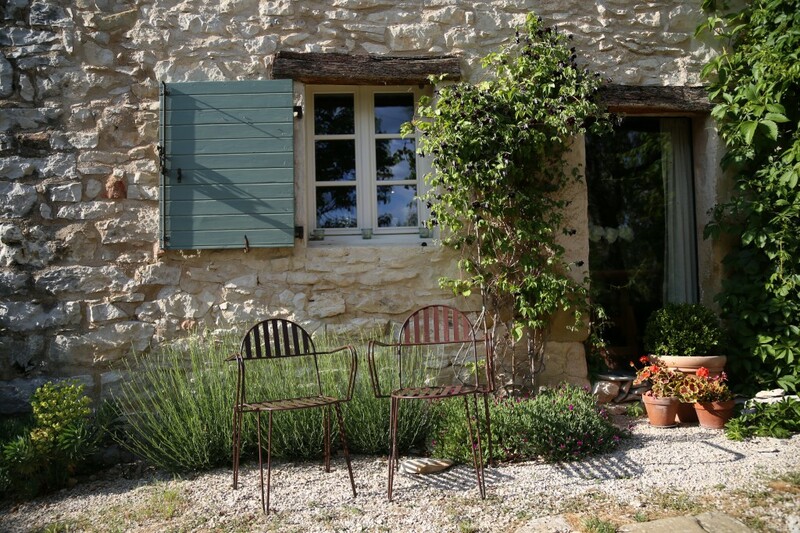 The Bouquet of France: An epicurean tour of the French provinces. Le Tour de France chez nous !